It’s a little ironic that Boris Karloff will always be remembered as having played Frankenstein’s monster, a victim of mad science gone wrong, because, more often than not, he was actually on the other end. He practically owned the “ambitious scientist” role for a couple of decades, wherein his characters were always dabbling in some kind of weird experiments often involving death (and cheating it, which makes the Frankenstein connection all the more ironic). 1940’s Black Friday was yet another one of these; I imagine that, at this point, it must have felt like this genre was taking up screens on a weekly rate. At least this one, however, also had Bela Lugosi tagging along (though, again, by this time, the two had starred together so many times that it probably seemed commonplace too). Like so many films of this type, Black Friday begins with Karloff’s character on death row. This time, he’s Ernest Sovac, who has been attempting to advance a theory about keeping the brain alive after death. As he heads to the electric chair, he drops off his journal to a newspaper man, who begins to read about a sordid tale involving Sovac’s friend, George Kingsley (Stanley Ridges). 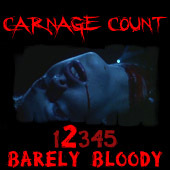 One fateful day, Kingsley ends up getting hit by a car driven by a bunch of gangsters; one of them is the nefarious Red Cannon (also played by Ridges), and he suffers a broken back in the accident. Desperate to save his friend (whose brain is damaged), Sovac decides to transplant Cannon’s brain into Kingsley’s body. Typical Jekyll/Hyde stuff follows as a result of these shenanigans, as Cannon’s mind soon begins to take over. It doesn’t help that Sovac takes the gangster back to his old haunts, where he’s stashed away some loot that Sovac hopes to steal to fund his experiments. That’s an odd character choice, and, even though it doesn’t come off as super malicious (Sovac genuinely wants to help humanity), it seems sneaky and at odds with Karloff’s grandfatherly persona. At any rate, it doesn’t matter too much, as Karloff gets a little lost in the proceedings anyway, as Black Friday soon becomes a typical gangster/revenge movie (once Cannon realizes he was set up), complete with a bunch of strangulations and gunshots. So it’s not enough that this is just a split personality flick (which, admittedly, was also being overdone by 1940), which speaks to how this one is a little overwrought, especially at a brisk 70 minutes. It has its moments, with most of them belonging to Ridges’s fine double performance as both the kind (and also grandfatherly) English professor and the Cagney-inspired crook. You won’t often find a film where both Karloff and Lugosi are overshadowed, but it happens here; in fact, Ridges melts so completely into both roles that I didn’t even realize he was playing both characters until about midway through. Red Cannon is the more interesting of the two personas, as he’s so unbridled, brash, and comes complete with a pretty dame (Anne Neal) and everything. If not for the “science gone haywire” slant, Black Friday would really just be a crime drama, what with all of the betrayals and plot twists. This is kind of a shame, really, because the moral questions that could arise never quite do, and the film rarely explores the underlying drama of a man performing this kind of science on a close friend. Also disappointing is how Lugosi is essentially the third wheel here; many films could boast pitting him and Karloff against each other, but this one is the only one that can brag about featuring both but never having them share the screen. In fact, I’m not sure if Lugosi’s crime boss is even aware of Sovac’s presence in all of this, which further reveals how fractured the narrative feels. Reflecting the personality split at the center of the story, Black Friday often feels divided and can’t keep much momentum as a result. There’s a few interesting things sprinkled in here and there, particularly with the science involved. It’s interesting that Kinglsey’s personality even remains at all, considering that Cannon’s brain is placed in his body; as we’re dealing with pseudo-science anyway, I guess it doesn’t matter, but that didn’t make a whole lot of sense. Further confounding things is how the transformation is handled; whenever Cannon begins to take over, Ridges literally changes into that getup, so it’s not like we’re seeing him trapped inside of Kingsley’s body. This seems to be a device only for the audience, as I think the characters within the film do see Kingsley, though an interaction at the end of the film even calls that into question. 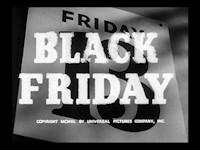 At any rate, I suspect Black Friday won’t be the most memorable experience for classic horror fans. Despite the star power, it really is just another tale involving science and revenge from beyond the grave (sort of--I suppose you can make the argument that Cannon’s brain technically never dies). If anything, I’m guessing audiences in 1940 would have been kind of aghast at how graphic the accident scene is--there’s a dash of blood smeared on the pavement and everything, which is quite grisly for the time. But, overall, something like Black Friday was probably feeling a little tired even back then, so parcel it out in your horror schedule (and don’t bother to check it out until you’ve seen the better offerings from this genre). Oddly enough, this one is part of Universal’s Lugosi Franchise Collection, which is really a bit of a misnomer considering all but one film on the release (Murders in the Rue Morgue) also features Karloff. The presentation is fine, as the 5 films (all of which are short in running time) are split across 2 sides; you might want to be warned that these flipper discs from Universal have been problematic for some, but it’s a release that’s worth having for a horror fan. Black Friday itself is a middle of the pack offering here, but one worth digesting after you’ve made it through the others. Actually, it’s probably best to stay inside and watch this instead of going out on the actual Black Friday, an unofficial holiday that deserves its own horror flick full of dismembered shoppers. Rent it!